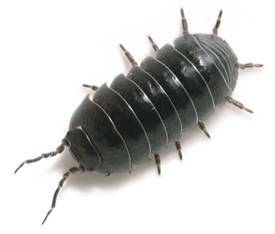 Pill bugs, also known as sowbugs or wood lice, are familiar backyard creepy crawlies to most of us. They are effective pests, since they have no specialized predators. There are 12 species of pill bugs found in the northern and central United States. Pill bugs prefer dark and moist places to live, such as in soil or under rocks. When inside a house, they frequently die due to the lack of moisture. However, if they do thrive, there may be a serious moisture problem within the household. Pest Solutions 365 can determine the size of the pill bug infestation and your pest control needs with a professional pest audit. Only $25 for a 20-minute inspection. First, determine whether your house is conducive to a pill bug’s lifestyle. You may need to tidy up your home, or your home may have a moisture problem. Remove all of the excess vegetation and debris from around your house to remove the food source. Control with outdoor insecticide applications around the foundation of the building. Apply insecticide in infested areas.